Crowned winners of Crystal Palace successfully defend title • BTC d.d. Živa Cesar and Boštjan Gams, who have been preparing the event the whole year long in cooperation with sports association Alive, are also happy about the incredible rise in the number of participants: this year, the challenge was taken up by almost 50% more runners than last year. The BTC Company, which hosts the event, immediately recognised the potential of the race on the Crystal Palace staircase. In the name of the Company, the event was officially opened by Damjan Kralj, MA, member of the BTC Management Board and the BTC Director of marketing. Representing the City Municipality of Ljubljana, the event was also opened by vice-mayor Dejan Crnek, while the project was furthermore realised in partnership with the Division of Paediatrics of University Medical Centre Ljubljana (UMCL) and the UMCL Sports association. This year’s challenge was a couple of stairs longer than in the previous year, because the route proceeded through the garage in order to avoid slippage. However, the king and queen, the winners of the Extreme Step Up, remained the same despite the additional 75 stairs – Karmen Klančnik and Matjaž Mikloša. 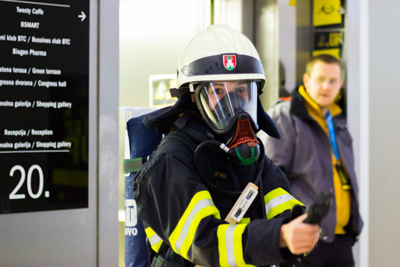 The most successful in the single run up 21 stories were Urša Pintar and Simon Novak, while other winners included the AD Kronos team relay, PGD Pobrezje 1 (firemen in full gear) and Haix Team Slovenija (firemen in full gear with breathing masks). We also got a new absolute record of the Crystal Palace, courtesy of the Intersport team relay, who beat the track in a good two minutes. The 2nd Alive Step Up was moderated by Andrej Težak – Tešky and David Urankar. Joining the run as its ambassadors were gymnasts Rok Klavora and Žiga Šilc, biathlon skier Klemen Bauer, skater, DJ and comic Klemen Bučan, cyclists Anja Rugelj and Urša Pintar, team Radio Antena, volleyball athlete Nejc Zemljak and comic Aleš Novak. Official timing was provided by Timing Ljubljana and the event was broadcast live at vzivo.si. Alive Training prepared the runners for the challenge, Dulcis Gourmet gifted every runner a chocolate French kiss, Butan Plin heated the event marquees, and numerous other supporters supplied ample awards for the runners and their fans. Partners of the Alive Step Up event also include Volvo, Perksindol, Philips, Inov8, Odlo and Printalnica.si. Congratulations to all who have braved the tallest staircase in Slovenia! All others are kindly invited to face this challenge next year, at the 3rd Alive Step Up, which will take place at the BTC City Crystal Palace on 19 November 2016.